Brrrr, it’s suddenly gotten chilly eh?! Well in London it has and I’ve been warming myself up with a mug bowl of hot chocolate. My little human, my sweetheart, knows her mind (I wonder who she gets that from ;)) She says to me “I want toastie and hot chocolate and two fried eggs”. Before I go feed my child, today’s Sunday Snippet is from the children’s book Oh Susannah: Things That Go Bump by Carole P. Roman. What is Oh Susannah: Things That Go Bump about? Susannah Maya Logan is not having a good day. She doesn’t want to go to her best friend, Lola’s sleepover. Susannah thinks the house is big and spooky, not to mention the ghost that is said to live there. Lola’s big brother, Kai, loves to tease Susannah with scary stories. Throughout her day, she sees people deal with things that scare them. Her sight-impaired friend, Macy, is terrified of unicorns, of all things. She sees a boy at a party who’s frightened of clowns. Her teacher is afraid of getting a cold. Susannah realizes everybody is scared of something. She wishes she was more like Lola, who is not afraid of anything, or so it seems. Susannah discovers people have different ideas of what is scary and what is not, and only they can determine the difference. Join Susannah as she learns to confront her fears and not let her imagination prevent her from having fun. The sun peeked through the blinds making a striped pattern across the bottom of Susannah Maya Logan’s comforter on the bed. Susannah opened her eyes and counted five panels of sunshine. The little brass alarm clock’s larger hand moved onto the twelve, the shorter hand jerked onto the seven, and the tiny hammer started to hit the bell so that the clock shook and trembled as if it was a dancing a jig. Susannah reached over, depressing the button, silencing the bell. Her door cracked open, Mom was tucking her shirt into her skirt. “Wake up, sleepy head.” She smiled. Susannah slid out of bed, reaching for the envelope. Her mother opened it before she could grab it. “A sleep-over, at the Simon’s. That sounds like fun,” she said cheerfully. Susannah thought for a minute. Was this a problem, she wondered. Not understanding homework was one thing, admitting that you thought a house was haunted was quite another. Mom handed the invitation to Susannah. Susannah was turning eight next Thursday and instead of a party, they had decided to have a mother-daughter spa day to celebrate. Susannah bit her lower lip. She was a big girl now. How could she tell her mother she was afraid to stay at Lola’s house? “Yes?” Mom raised an eyebrow, while she watched Susannah intently. Susannah almost wished Mom was busy with her own work as she had been the day before her school bag exploded. It was almost easier to ignore an issue when nobody was paying attention to her. Both Mom and Dad decided to sit with Susannah for breakfast. Dad drank his coffee and ate toaster pastries as if he had all the time in the world. Mom made both Susannah and herself open-faced grilled cheese sandwiches. Mom and Dad chatted about their big dinner, while Susannah picked at her sandwich. “I thought you liked this better than oatmeal?” Mom said as she put an apple into Susannah’s lunch bag. “No banana today!” she said with a huge grin, followed by a chuckle when she remembered the exploded banana in the bag. What a mess! Susannah forced a smile to her face. They were trying so hard. She remembered yesterday when she had to fight to get their attention. Now it felt like she had too much! I really enjoyed that, how about you? If you would like to read the rest of the story, you can buy your own copy of Oh Susannah: Things That Go Bump on Amazon now. Please leave a comment below too 😀 Would love to know what you think of the book too. 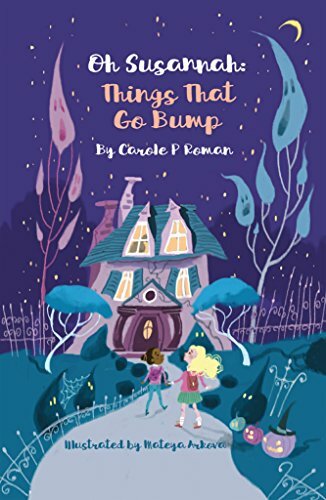 This entry was posted in Children's Corner, Sunday Snippets and tagged Carole P. Roman, children's book, Things That Go Bump. Bookmark the permalink.